For other uses, see The Dress. The photo originated from a washed-out colour photograph of a dress posted on the social networking service Tumblr. Within the first week after the surfacing of the image, more than 10 million tweets mentioned the dress, using hashtags such as #thedress, #whiteandgold, and #blackandblue. Although the actual color was eventually confirmed as blue and black, the image prompted many discussions, with users debating their opinions on the colour and how they perceived the dress in the photograph as a certain colour. Members of the scientific community began to investigate the photo for fresh insights into human color vision. About a week before the wedding of couple Grace and Keir Johnston of Colonsay, Scotland, the bride's mother, Cecilia Bleasdale, took a photograph of a dress she planned to wear to the wedding and sent it to her daughter. After disagreements over the perceived colour of the dress in the photograph, the bride posted the image on Facebook, and her friends also disagreed over the colour; some saw it as white with gold lace, while others saw it as blue with black lace. For a week, the debate became well known in Colonsay, a small island community. On the day of the wedding, Ceitlin McNeill, a friend of the bride and groom and a member of the Scottish folk music group Canach, performed with her band at the wedding on Colonsay. Even after seeing that the dress was "obviously blue and black" in real life, the musicians remained preoccupied by the photograph; they said they almost failed to make it on stage because they were caught up discussing the dress. A few days later, on 26 February, McNeill reposted the image to her blog on Tumblr and posed the same question to her followers, which led to further public discussion surrounding the image. Cates Holderness, who ran the Tumblr page for Buzzfeed at the site's New York offices, noted a message from McNeill asking for the site's help in resolving the colour dispute of the dress. At the time she dismissed it, but then checked the page near the end of her workday and saw that it had received around 5,000 notes in that time, which she said "is insanely viral [for Tumblr]". Tom Christ, Tumblr's director of data, said at its peak the page was getting 14,000 views a second (or 840,000 views per minute), well over the normal rates for content on the site. By later that night, the number of total notes had increased tenfold. Holderness showed the picture to other members of the site's social media team, who immediately began arguing about the dress's colours amongst themselves. After creating a simple poll for users of the site, she left work and took the subway back to her Brooklyn home. When she got off the train and checked her phone, it was overwhelmed by the messages on various sites. "I couldn't open Twitter because it kept crashing. I thought somebody had died, maybe. I didn't know what was going on." Later in the evening the page set a new record at BuzzFeed for concurrent visitors, which would reach 673,000 at its peak. The viral image became a worldwide Internet meme across social media. On Twitter, users created the hashtags "#whiteandgold," "#blueandblack," and "#dressgate" to discuss their opinions on what the colour of the dress was, and theories surrounding their arguments. The number of tweets about the dress increased throughout the night; at 6:36 pm EST, when the first increase in the number of tweets about the dress occurred, there were five thousand tweets per minute using the hashtag "#TheDress," increasing to 11,000 tweets per minute with the hashtag by 8:31 pm. EST. The photo also attracted discussion relating to the triviality of the matter as a whole; The Washington Post described the dispute as "[the] drama that divided a planet". Some articles humorously suggested that the dress could prompt an "existential crisis" over the nature of sight and reality, or that the debate could harm interpersonal relationships. Others examined why people were making such a big argument over a seemingly trivial matter. That evening, Wellesley College neuroscientist Bevil Conway gave some comments on the phenomenon to Wired reporter Adam Rogers. Before they hung up, Rogers warned him, "your tomorrow will not be the same". Conway thought the reporter was exaggerating, saying, "I didn't appreciate the full extent of what was about to happen. Not even close." Rogers's story eventually got 32.8 million unique visitors. Meanwhile, when Conway woke up the next morning, his inbox had so many emails about the dress that at first, he thought his email had been hacked, until he saw that the bulk were interview requests from major media organisations. "I did 10 interviews and had to have a colleague take my class that day," said Conway. Celebrities with larger Twitter followings began to weigh in overnight. Taylor Swift's tweet—which described how while she saw it as blue and black, the whole thing left her "confused and scared"—was retweeted 111,134 times and liked 154,188 times. Jaden Smith, Frankie Muniz, Demi Lovato, Mindy Kaling, and Justin Bieber agreed that the dress was blue and black, while Anna Kendrick, B. J. Novak, Katy Perry, Julianne Moore, and Sarah Hyland saw it as white and gold. Kim Kardashian tweeted that she saw it as white and gold, while her husband Kanye West saw it as blue and black. Lucy Hale, Phoebe Tonkin, and Katie Nolan saw different colour schemes at different times. Lady Gaga described the dress as "periwinkle and sand," while David Duchovny called it teal. Other celebrities, including Ellen DeGeneres and Ariana Grande, mentioned the dress on social media without mentioning specific colours. Politicians, government agencies and social media platforms of well-known brands also weighed in tongue-in-cheek on the issue. Ultimately, the dress was the subject of 4.4 million tweets within 24 hours. In the UK, where the phenomenon had begun, Ian Johnson, creative manager for dress manufacturer Roman Originals, learned of the controversy from his Facebook news feed that morning. "I was pretty gobsmacked. I just laughed and told the wife that I'd better get to work," he said. We've seen other stories go viral, but the sheer diversity of outlets that picked it up and were talking about it was unlike anything we had ever seen. Everyone from QVC to Warner Bros. to local public libraries to Red Cross affiliates were all posting links to it on their social accounts. That kind of diversity in who's sharing a story pretty much never happens...and certainly never to that degree. Even in the year since and with a million different people trying to replicate it, nothing has come close. Businesses that had nothing to do with the dress, or even the clothing industry, devoted social media attention to the phenomenon. Adobe retweeted another Twitter user who had used some of the company's apps to isolate the dress's colours. "We jumped in the conversation and thought, Let's see what happens," recalled Karen Do, the company's senior manager for social media. Jenna Bromberg, senior digital brand manager for Pizza Hut, saw the dress as white and gold and quickly sent out a tweet with a picture of pizza noting that it, too, was the same colours. Do called it "literally a tweet heard around the world". Ben Fischer of the New York Business Journal reported that interest in the first BuzzFeed article about the dress exhibited vertical growth instead of the typical bell curve of a viral phenomenon, leading BuzzFeed to assign two editorial teams to generate additional articles about the dress to drive ad revenue, and by 1 March, the original BuzzFeed article had received over 37 million views. The dress was cited by CNN commentator Mel Robbins as a viral phenomenon having the requisite qualities of positivity bias incorporating "awe, laughter and amusement," and was compared to and contrasted with the llama chase earlier that day, as well as to tributes paid to actor Leonard Nimoy after his death the following day. The dress itself was confirmed as a royal blue "Lace Bodycon Dress" from the retailer Roman Originals, which was actually blue-and-black in colour; although available in three other colours (red, pink, and ivory, each with black lace), a white and gold version was not available at the time. The day after McNeil's post, Roman Originals' website experienced a major surge in traffic; a representative of the retailer stated that "we sold out of the dress in the first 30 minutes of our business day and after restocking it, it's become phenomenal". On 28 February, Roman announced that they would make a single white and gold dress for a Comic Relief charity auction. On 3 March, Ellen DeGeneres had Grace, Keir, Ceitlin, and Cecelia as guests on her show. After revealing that she sees the dress as white and gold, DeGeneres presented each of them with gifts of underwear patterned after the dress but combining both colour schemes, and show sponsors also gave the Johnstons a gift of $10,000 and a honeymoon trip to Grenada, as they had left their honeymoon early to participate in the show. By 1 March, over two-thirds of BuzzFeed users polled responded that the dress was white and gold. Some people have suggested that the dress changes colours on its own. Media outlets noted that the photo was overexposed and had poor white balance, causing its colours to be washed out, giving rise to the perception by some that the dress is white and gold rather than its actual colours. * white and gold under a blue-tinted illumination (right figure). There is currently no consensus on why the dress elicits such discordant color perceptions among viewers, though these have been confirmed and characterized in controlled experiments (described below). No synthetic stimuli have been constructed that are able to replicate the effect as clearly as the original image. Our visual system is supposed to throw away information about the illuminant and extract information about the actual reflectance... but I've studied individual differences in colour vision for 30 years, and this is one of the biggest individual differences I've ever seen. Similar theories have been expounded by the University of Liverpool's Paul Knox, who stated that what the brain interprets as colour may be affected by the device the photograph is viewed on, or the viewer's own expectations. Neuroscientist and psychologist Pascal Wallisch states that while inherently ambiguous stimuli have been known to vision science for many years, this is the first such stimulus in the colour domain that was brought to the attention of science by social media. He attributes differential perceptions to differences in illumination and fabric priors, but also notes that the stimulus is highly unusual insofar as the perception of most people does not switch. If it does, it does so only on very long time scales, which is highly unusual for bistable stimuli, so perceptual learning might be at play. In addition, he says that discussions of this stimulus are not frivolous, as the stimulus is both of interest to science and a paradigmatic case of how different people can sincerely see the world differently, an acknowledgement of which is a precondition for world peace. Daniel Hardiman-McCartney of the College of Optometrists stated that the picture was ambiguous, suggesting that the illusion was caused by a strong yellow light shining onto the dress, and human perception of the colours of the dress and light source by comparing them with other colours and objects in the picture. The philosopher Barry C. Smith compared the phenomenon with Ludwig Wittgenstein and the rabbit–duck illusion. The Journal of Vision, a scientific journal about vision research, announced in March 2015 that a special issue about the dress would be published with the title A Dress Rehearsal for Vision Science. Scientific work is ongoing. The first large-scale scientific study on the dress was published in Current Biology three months after the image went viral. The study, which involved 1,400 respondents, found that 57% saw the dress as blue and black; 30% saw it as white and gold; 11% saw it as blue and brown; and 10% could switch between any of the colour combinations. A small number saw it as blue and gold. Women and older people disproportionately saw the dress as white and gold. The researchers further found that if the dress was shown in artificial yellow-coloured lighting almost all respondents saw the dress as black and blue, while they saw it as white and gold if the simulated lighting had a blue bias. Another study in the Journal of Vision, by Pascal Wallisch, found that people who were early risers were more likely to think the dress was lit by natural light, perceiving it as white and gold, and that "night owls" saw the dress as blue and black. The dress is the subject matter of a novel ‘The White & Gold People’ which sees the group referred to as Goldies evolve into a new species with superhuman abilities and higher intelligence, called homo pas horáō (all seeing man). The dress effectively captured the collective attention of online networks; in South Africa, the Salvation Army has attempted to re-direct some of this mass awareness towards the issue of domestic violence. As the original authors of the photograph that sparked the viral phenomenon, Bleasdale and her partner Paul Jinks later expressed frustration and regret over being "completely left out from the story", including their lack of control over the story, the omission of their role in the discovery, and the commercial use of the photograph. The dress was included on multiple year-end lists of notable internet memes in 2015. Popular arcade hopper game, Crossy Road, includes a "The Dress" character in its lineup of blocky avatars. The American Dad! character Roger is seen to be wearing "The Dress" at a gala he attends in Season 11 Episode 12 "The Dentist's Wife" released in April 2016. ^ Katie Grant (30 October 2015). "The Dress: Roman Originals co-founder Peter Christodoulou on how viral image left company sitting pretty". The Independent. ^ "Lace Detail Bodycon Dress". Retrieved 27 February 2015. ^ a b "The blue and black (or white and gold) dress: Actual color, brand, and price details revealed". The Independent. 27 February 2015. Retrieved 10 May 2015. ^ a b "Optical illusion: Dress color debate goes global". BBC News. BBC. 27 February 2015. Retrieved 28 February 2015. ^ a b c d e f "The inside story of the 'white dress, blue dress' drama that divided a planet". The Washington Post. Retrieved 27 February 2015. ^ a b c "The Dress Is Blue And Black, Says The Girl Who Saw It in Person". BuzzFeed. Retrieved 27 February 2015. ^ a b "Ellen DeGeneres Settles the Great Dress Debate Once and For All!". Entertainment Tonight. Retrieved 20 March 2016. ^ a b c d e f g h i j Warzel, Charlie (26 February 2015). "2/26: The Oral History". BuzzFeed. Retrieved 28 February 2016. ^ a b "#TheDress couple: 'we were completely left out from the story'". BBC News. 1 January 2016. Retrieved 28 January 2016. ^ Klassen, Anna (26 February 2015). "What Colors Are This Dress? White & Gold or Black & Blue? The Internet Is Going Insane Trying To Find Out – PHOTO". Bustle. Retrieved 27 February 2015. ^ "Color Bind: This Dress is White and Gold, Right?". Boston Globe. Retrieved 27 February 2015. ^ "The Official Live Blog: Is This Dress Blue and Black or White and Gold?". Slate. 27 February 2015. Retrieved 27 February 2015. ^ King, Kirsten (26 February 2015). "This Dress Is Ruining People's Lives". BuzzFeed. Retrieved 1 March 2015. ^ "Why do we care about the colour of the dress?". The Guardian. 27 February 2015. Retrieved 28 May 2015. ^ "What Colors Are This Dress? Kim Kardashian, Miley Cyrus, Justin Bieber and a Bajillion Other Celebs Weigh In". MTV News. ^ "#Dressgate: The white and gold dress making our mind work until it's black and blue". The Sydney Morning Herald. 27 February 2015. Retrieved 27 February 2015. ^ Iyengar, Rishi. "The Dress That Broke the Internet, and the Woman Who Started It All". Retrieved 27 February 2015. ^ Sanchez, Josh (26 February 2015). "'What color is this dress' confused celebrities, too". Fansided.com. Retrieved 27 February 2015. ^ Mahler, Jonathan. "A White and Gold Dress Overloads the Internet". The New York Times. Retrieved 27 February 2015. ^ Iyengar, Rishi (26 February 2015). "Taylor Swift Says The Dress is Black and Blue". Time. Retrieved 1 March 2015. ^ Jim Dalrymple II. "Politicians, Police, And Brands Have Weighed in On "The Dress"". Buzzfeed.com. Retrieved 6 March 2015. ^ Fischer, Ben (27 February 2015). "The Dress phenomenon didn't happen by accident. It took big money". New York Business Journal. American City Business Journals. Retrieved 1 March 2015. ^ Holderness, Cates (26 February 2015). "What Colors Are This Dress?". BuzzFeed. Retrieved 1 March 2015. ^ Robbins, Mel (28 February 2015). "Why blue/black/white/gold dress went viral". CNN. Retrieved 3 March 2015. ^ "'The Dress' flying off racks following Internet sensation: 'We sold out in the first 30 minutes of our business day'". Daily News. New York. Retrieved 27 February 2015. ^ "'The Dress' returns in special edition gold and white version for Comic Relief charity auction". The Independent. 10 March 2015. Retrieved 10 March 2015. ^ "Why that dress looks white and gold: It's overexposed". Mashable. Retrieved 27 February 2015. ^ González Martín-Moro, J.; Prieto Garrido, F.; Gómez Sanz, F.; Fuentes Vega, I.; Castro Rebollo, M.; Moreno Martín, P. (April 2018). "Which are the colors of the dress? Review of an atypical optic illusion". Archivos de la Sociedad Española de Oftalmología (English Edition). 93 (4): 186–192. doi:10.1016/j.oftale.2018.02.003. ^ a b "The Science of Why No One Agrees on the Color of This Dress". Wired. 27 February 2015. Retrieved 27 February 2015. ^ a b Sample, Ian (14 May 2015). "#TheDress: have researchers solved the mystery of its colour?". The Guardian. ^ "Viewpoint: Blue and black or white and gold?". News.liv.ac.uk. Retrieved 27 February 2015. ^ "An experts lesson from the dress". Slate. 2 March 2015. Retrieved 6 March 2015. ^ "Why discussing the dress is not frivolous". pascallisch.net. 2 March 2015. Retrieved 6 March 2015. ^ Hardiman-McCartney, Daniel (2 March 2015). "#Thedress and your optometrist – the scientific voice of reason". College of Optometrists. ^ "What would Wittgenstein say about that dress?". BBC. 27 February 2015. Retrieved 6 March 2015. ^ "Journal of Vision – Special Issue on The Dress". 12 March 2015. Archived from the original on 9 May 2015. Retrieved 10 May 2015. ^ "- JOV - ARVO Journals - JOV - ARVO Journals". jov.arvojournals.org. ^ a b Rosa Lafer-Sousa; Katherine L. Hermann; Bevil R. Conway (29 June 2015). "Striking individual differences in color perception uncovered by 'the dress' photograph". Current Biology. 25 (13): R545–R546. doi:10.1016/j.cub.2015.04.053. PMC 4921196. PMID 25981795. Retrieved 30 December 2015. ^ Karl R. Gegenfurtner; Marina Bloj; Matteo Toscani (29 June 2015). "The many colours of 'the dress'". Current Biology. 25 (13): R543–R544. doi:10.1016/j.cub.2015.04.043. PMID 25981790. Retrieved 30 December 2015. ^ Alissa D. Winkler; Lothar Spillmann; John S. Werner; Michael A. Webster (29 June 2015). "Asymmetries in blue–yellow color perception and in the color of 'the dress'". Current Biology. 25 (13): R547–R548. doi:10.1016/j.cub.2015.05.004. PMC 4489998. PMID 25981792. Retrieved 30 December 2015. ^ Wallisch, Pascal (7 April 2017). "Illumination assumptions account for individual differences in the perceptual interpretation of a profoundly ambiguous stimulus in the color domain: "The dress"". Journal of Vision. 17 (4): 5. doi:10.1167/17.4.5. PMID 28388701. ^ Wallisch, Pascal (12 April 2017). "Two Years Later, We Finally Know Why People Saw "The Dress" Differently". Slate. Retrieved 3 March 2018. ^ Knapton, Sarah (15 March 2016). "Dressgate: If you saw THAT dress as white your brain was working overtime". The Telegraph. ^ Schlaffke, Lara (December 2015). "The brain's dress code: How The Dress allows to decode the neuronal pathway of an optical illusion". Cortex. 73: 271–275. doi:10.1016/j.cortex.2015.08.017. PMID 26478963. ^ "The White and Gold People by Segun Starchild". Circle of Books. 18 February 2019. Retrieved 11 March 2019. ^ "Salvation Army uses The Dress in ad targeting violence against women". CBC News. 6 March 2015. Retrieved 25 March 2015. ^ "The 15 Best Memes of 2015". Entertainment Weekly's EW.com. Retrieved 20 March 2016. ^ "24 Memes That Took The Internet By Storm in 2015". MTV News. Retrieved 20 March 2016. 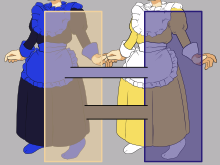 Wikimedia Commons has media related to The dress.